Your box scheme was started in 1997 by a bunch of environmental activists living at Keveral Farm. We had all been studying Permaculture. 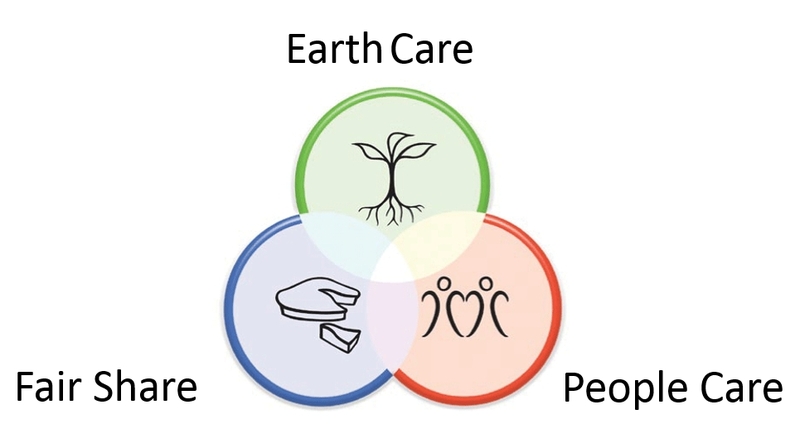 Permaculture is a design system for looking at our lives and our business activities (how we as humans support ourselves) that uses principles drawn from natural systems and an ethical framework that can be summarised as: Earth Care working in ways that reduce harm to our ecosystem. People Care working in ways that allow everyone to participate and have their needs met, and Fair Share making sure there are enough resources to go around for all living things. We had Organic land, though we were mostly not very experienced at growing. Keveral Farm is a Cooperative Housing project as well as a farm and at any time there are about a dozen families or individuals living here needing to support ourselves. So there was a pool of labour and people who wanted to learn about growing. We wanted to engage and interact with our local community and raise awareness of various issues that impact on the environment. We cared about good, nutritious food, produced with care about its impacts on the environment. We wanted to be able to supply it at prices people like ourselves would find affordable. We wanted to support small local growers and support and encourage people to be able to live in a rural area and at least make part of their income from the land and not have to commute to the nearest big town for work, at a time when increasing numbers of small farmers were going under and farmers were being told the future was bigger specialist farms and that small mixed farms had had their day. Our model has continued to be one of cooperation and sharing: a model which has seen the box scheme through some tough times and survived for 20 years. We have no staff. We are a partnership of self-employed growers and we all contribute a few hours each week to administer and deliver the boxes, which in turn helps us to sell our produce and keep our prices down. 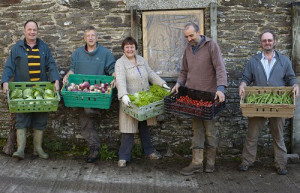 As growers we can make our money by selling our produce to the box scheme. Thus many hands make the work easier and means everyone still has time to work, growing or whatever else they do (activists, carers, consultants), and we can help each other be flexible about time off to take on other tasks when it’s important. Some of our grower members do something else alongside their farming, at least for part of the year. Many are not big enough growers for their businesses to stand alone, or are new entrants to the industry and learning but with your support they can make additional income from their growing and be able to have some crop failures, but learn and survive. Other growers have grown successfully and gone on to develop new markets, employ people and become secondary suppliers, becoming less hands-on with the boxes. This mimics the natural principal that many elements support key functions in ecosystems and build in redundancies that stop them failing. Growing: The veg box scheme launched in mid 1997. We hoped to interest 30 local families but were immediately oversubscribed. This encouraged us to produce more produce than we had thought we could. All the members of Keveral Farmers workers Coop got stuck in. We applied for some funding and bought our first large polytunnels. Over four years we gave eight people on the farm part time jobs. Cooperating: After a number of years we recognised that the amount of space we had to grow on at Keveral Farm was not sufficient for the number of customers we looked like we would soon have. We wanted to work with other growers and in August 2000 we had the opportunity to work with the Candy Family on the opposite side of Seaton Valley when they decided to make Trerieve Farm organic. We grew our first large field of brassicas with the help and guidance of Jim and his tractor. This relationship has continued to the present day. We bought two large twin span tunnels to increase the amount of sheltered growing all year round. All was going well on the farm, more and more customers were joining the box scheme. But our business sense wasn’t keeping up with our ideals. Tougher times: By 2003 the box scheme had grown to around 180 families but the Workers’ Cooperative at Keveral was having hard times. Too many people were trying to make a living from the land and we weren’t doing it well enough, we idealistically tried to split the income from our farming evenly between us all, despite the fact that some people actually worked much harder than others. This left people conflicted and threatened to undermine our friendships. We kept the boxes going for a few more years as they were, but ultimately we decided that we should all step back from the income sharing and would try to run the box scheme as a sort of franchise where one person took responsibility for running it. That person would sort out the deliveries and grow their own produce and buy other produce from other growers. This seemed like a reasonable idea. If people worked harder they could be free to make more and other people could sell smaller amounts of things when they had them if they wished. However after only a few months the person who had taken on the business was struggling. Basically the work of administering, packing and delivering the veg is most of a week’s work (in several days) and there is no time to grow your own veg well if you are trying to do all the other tasks simultaneously. Unfortunately the rest of us didn’t realise that things were so hard, our other farm work was keeping us all busy, other businesses were developing and over the next few years customer numbers dropped dramatically as the business failed to keep on top of everything. Customer numbers dropped until there were only 40 families… the lowest ever. Community of Growers to the rescue! The problem with the box scheme is it’s not a large enough business to support the employment of staff, lots of overheads and the purchase and running of delivery vehicles. It took us a long time to figure that out, initially as it was just one bit of a bigger farming venture and then because we were too inexperienced at business. Running the scheme itself is a full weeks’ work but work that’s needed to be done in three days. It’s really not possible for one person to do it and grow vegetables as well. Permaculture principles describe this sort of problem as a single element in a system carrying out many functions which is fine unless the element can’t do it. Looking at natural systems there are always many elements carrying out important functions so if one fails there is often another that backs it up and the system doesn’t collapse. When Sean took on managing the box scheme to rescue it in 2009 he soon found that this is a challenge. However all the suppliers got together and various people offered to take on different tasks in order to make it work. After all it sells our veg. So the Community of Growers was born. People contributed a few hours each week to sorting out the orders, packing or delivering to different areas. At first we were all volunteers contributing our time for free to help make the scheme work. For most people that’s a long morning or afternoon’s work each week. We even started to deliver to Plymouth. Eventually we settled into a rhythm that works and now we can offer a basic wage to everyone who helps get your box to you.